Black folks are justifiably paranoid when it comes to Black leaders coming under attack from the status quo media and other special interests. That’s why the hairs stand up on the back of our necks when the major media, abated by the special interests focuses unrelenting attention on the candidacy of Sheriff David Clarke. What is Clarke’s crime? Apparently, it’s that he refuses to follow the script provided by our Democratic Party benefactors. He’s also uppity and uncontrollable. The Shepherd Express charges he’s ‘conservative,’ a code word signaling that he is somehow not Black because he dares talk about the importance of strong Black nuclear families, educational options and traditional Christian values. And of course, some representatives of the Negrocracy say Clarke is not a member of their fraternity and thus should not be supported by the Black masses. How dare he question their inaction on poverty, crime and closing the academic achievement gap? How dare he indeed. Clarke questions if our Black politicians have moved the Black community forward; whether they have advanced policies that improve the quality of life for Black people or whether they merely advocate policies and programs that keep Black folks trapped in poverty and despair. Is he right? 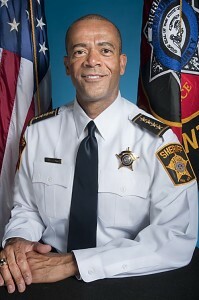 There is a reason why most Black folks view Clarke as a folk hero of sorts and why the aforementioned entities are working overtime to defeat him in his bid to retain his position as Milwaukee County Sheriff. Clarke is a threat to the status quo. He refuses to remain quiet as our community deteriorates and our traditional values are undermined. I’m not saying that I agree with everything David Clarke says. But while we can disagree with some of his rhetoric, or question whether he sometimes paints with a broad brush, we cannot deny he raises questions that need to be addressed. Nor can we dismiss his competency as a law enforcement aficionado, with over 30 years on the front lines. And that’s the real issue here: Is he an effective law enforcement leader, not whether he speaks out about teen pregnancy or the competency of Black politicians. Nor should we forget that while the mayor, chief of police and district attorney were hiding out after the death (ruled a homicide) of Derek Williams, David Clarke was at the rally. In fact, unlike most ‘leaders’ Clarke can be found at Black churches nearly every week, or addressing Black organizations about self defense or speaking out on television or on radio. Like I said, you don’t have to always agree with David Clarke. I don’t. But I respect him for taking a stance, for advocating solutions and for standing up against the status quo, which has, by most measurements, failed us. I also question why a special interest has invested a quarter of a million dollars for advertising opposing his candidacy a few weeks after Clarke declared that this city couldn’t move forward until the political leaders address the poverty problem. Incidentally, the Black poverty rate was 40 percent when President Johnson declared war on it in 1965. Nationally, today it is 42 percent. And Milwaukee holds the distinction of having the highest Black male unemployment rate in the country. Those who know me probably assume I support David Clarke merely because he’s an African American. And to be honest, that’s part of the equation. If all things are equal, “go black” has been my motto. But David Clarke deserves your vote next week for many complimentary reasons. We should vote for him not only as a signal to those special interests that are orchestrating a concerted attack against him, but also because he’s the best man for the job. Most of all, he’s has been an effective sheriff. And if he questions the status quo when not patrolling our streets, that’s OK with us.